I just wanted to take the time to thank each and every one of you at RDD. After attempting to quit Suboxone® several times with no success, I came across your site, and after speaking with Jeanne, I knew that this would be my last and final fight to beat this addiction. 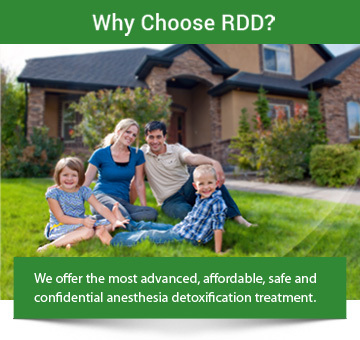 Let me just say, from the moment I walked into the clinic, and to the time I was released, I was amazed with the nurturing and care I received from the staff at RDD. You all saved my life, and I will be forever grateful and will hold you in my heart forever. I highly recommend this procedure to anyone who has had the same issues at quitting as I did. Thanks again, and keep up the excellent work.